Updated 10/9/13: Goodreads giveaway is complete. CONGRATS to the winner: Sarah N.
Thanks to all who entered and expressed interest in VIGILANTE NIGHTS! 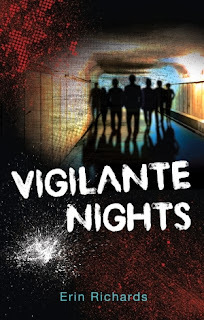 I'm giving away an autographed hardcover copy of VIGILANTE NIGHTS, plus book swag. Enter at Goodreads for your chance to win! Giveaway ends October 7, 2013. His beloved twin dead, his future destroyed, Lucas forms a “vigilante posse” to take revenge on the gang members responsible. Can his new love, and his sister’s voice from beyond death, stop Lucas from self-destruction? Although he’s the class clown, Lucas has charm, looks, athletic prowess, and a scholarship that will mean a bright future. That is, until the night he and his beloved twin, Silver, drive into the middle of a gang ritual on a California beach road. Waking from a coma to learn that Silver is dead, and his body and dreams shattered, Lucas turns to revenge. Then, Silver appears, crossing the line between life and death to try to save her brother. The new girl in his neighborhood can see Silver too, and shares her fears. But their love isn’t enough to stop Lucas’s posse of “vigilantes” from an act of stunning violence that marks him for murder. Can Lucas face the truth about what he’s become, and about Silver’s hidden past, or is it too late?